Some things go perfectly with a summer trip to the coast: sunscreen, mystery novels, cold beverages, and sand castles. Other things—like algae blooms or polluted runoff—are a lot less appealing. 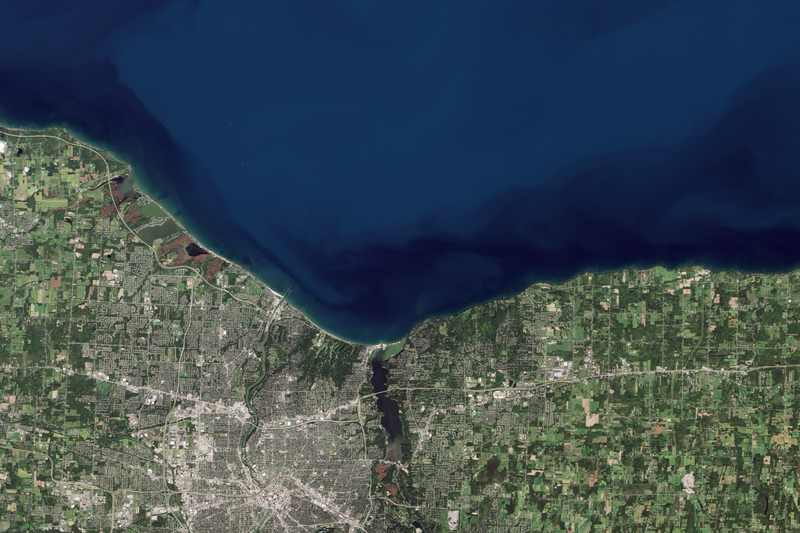 The newest generation of Landsat satellite is helping researchers identify and study potential problem areas from space. Most remote sensing satellites, including the long-running Landsats, detect the intensity of different wavelengths of light that reflect off of Earth’s surfaces, from forests to fields to cities. But water poses a challenge. It absorbs and scatters a lot of light, so oceans and lakes tend to look dark or lack detail on satellite images, especially in the murky waters near the coast. “All of the interesting stuff was typically lost in the noise of the old instruments,” said John Schott, a researcher at the Rochester Institute of Technology. The natural-color image at the top of this page was acquired on September 19, 2013, by the Operational Land Imager (OLI) on Landsat 8. It shows a southern shore of Lake Ontario near Rochester, New York, as it might appear to the human eye. Beyond the blue of that water, Schott and his colleagues are paying close attention to three colors—green, yellow, and gray—to decipher what’s floating in Lake Ontario. Green wavelengths indicate the presence of chlorophyll, the molecule found not only in land plants but also algae and other phytoplankton. Yellow usually hints at the presence of decaying plant matter. Grays come from airborne particulates like dust and soil, or from dead algae that have lost their chlorophyll. “It’s a classic color problem. All of these things together give the water a color,” Schott said. “You can unmix these to give you the components.” That’s exactly what his research team is now doing. Over the past year, members of Schott’s research group have paddled or motored out into the lake to sample the waters on the same days that Landsat 8 has passed overhead (which happens once every 16 days). The team then compares the chemistry and visual quality of those water samples with what the satellite sees. The researchers are using these comparisons to create data tables and computer programs that will eventually turn remote satellite images into timely information for local managers of water quality. The area inside the inset box of the top image is shown in scientific detail in the two lower images. The left map uses wavelength data from OLI to show the levels of chlorophyll in the lake and nearshore water bodies. Plants and phytoplankton use this pigment to convert photons of light into food. The lower right map uses Landsat data to show the amount of suspended sediment in the water. Silt, soil, sand, dissolved plant matter (from microscopic algae to leaves), and other floating debris naturally flow out from inland waterways to the coast, carrying both nutrients and pollutants. NASA Earth Observatory images by Jesse Allen, using data provided courtesy of John Schott and Javier Concha, Rochester Institute of Technology. Caption by Kate Ramsayer, with Michael Carlowicz.